A large bolt of lightning strikes the ground Tuesday evening near the residence of Johnny Craft, who submitted this photo. 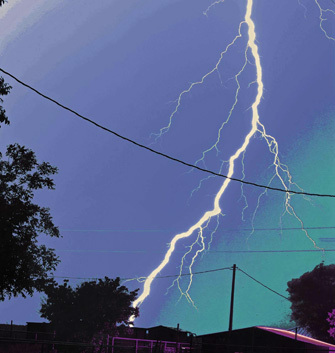 Artesians were treated to an impressive light show Tuesday, as atmospheric eruptions surfaced on all four sides of the community, followed by solid rainfall that continued into the early hours of this morning. The New Mexico State University Ag Science Center reported .76 inches of precipitation, and a 50-percent chance of additional moisture is forecast for today.